The bridge-opening celebration for the Golden began on May 27, 1937 and lasted for one week. The day before vehicle traffic was allowed, 200,000 people crossed either on foot or on roller skates. A Young America and a “handful” of her citizens stop for a picture before walking across the newly constructed bridge that would become a world wide icon of the Northwest United States. Well, because it’s just awesome! But mostly because of what waves quietly, perfectly positioned in center stage. Old Glory-In all her glory. (click image to zoom). praises and blessings to a late posterity. As a way of saying thanks to everyone who takes time to visit Maiden on the Midway I’d like to offer you a free downloadable PDF of The Pocket Catechism on the Constitution, originally published in 1828! I’ve been reading it and it explains how and why our constitution works that’s easy to understand. Click here to download your copy now. Soldiers from 3rd Howitzer Section, Alpha Battery, 2-8th Field Artillery fire the M777 at COP Wolverine in Zabul Province, Afghanistan. I believe I’ve seen photos of our post 9/11 veterans checking for snipers using the same method.. 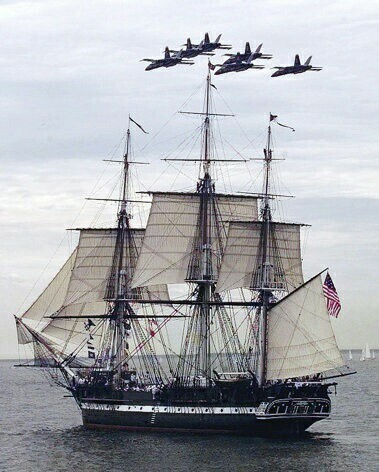 The USS Constitution, which was first launched in 1797, will be tugged from its berth in Boston Harbor on Sunday into the harbor. It will then set out to open seas for a 10-minute cruise. The short trip marks the day two centuries ago when the Constitution bested the British frigate HMS Guerriere in a fierce battle during the War of 1812. It follows a three-year restoration project and is the first time the Constitution has been to sea on its own since its 200th birthday in 1997. Left to right – Hood, Semmes, Davis, Stuart, Jackson, Lee, Forrest, Johnston, Beauregard.